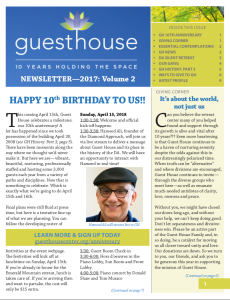 “This coming April 15th, Guest House celebrates a milestone: our 10th anniversary! A lot has happened since we took possession of the building April 28, 2008 (see GH History: Part 3, page 5). There have been moments along the way where we thought we’d never make it. But here we are—vibrant, beautiful, nurturing, professionally staffed and hosting some 3,000 guests each year from a variety of paths and disciplines. Now that is something to celebrate. Which is exactly what we’re going to do April 15th and 16th. Final plans were still fluid at press time, but here is a tentative line-up of what we are planning. You can follow the developing roster of festivities at the event webpage.